Online shopping has become more prevalent than ever in today’s modern society due to the positive shift in consumers’ attitude and mindset towards e-commerce. This boom in online shopping has adversely affected the sales of traditional brick and mortar shops. In India alone, e-commerce is the fastest growing retail channel that is estimated to grow from $3.1 billion to $22 billion in five years according to a report by the CLSA. Online retailers have been offering aggressive discounts prioritising market share over profits. As a result, many small and regional offline retailers have been forced to close down as they simply cannot compete with such predatory online pricing. In order for offline retailers to stay competitive and relevant in this digital age, there is a need for sales staff to pick up new skills to attract more customers. According to an interview with PwC, Cushman &Wakefield senior vice president JasonSpeckman, there has been a decrease in retail foot traffic from 35 billion visits in 2009 to 17 billion in 2013. The increasing price transparency of goods due to the internet has led to steep competition between retail stores. Sales employees need to be able to stay relevant and competitive in our current world. Some reports also estimate that in 20 years, close to half of our current jobs will be automated. The evolving nature of our jobs clearly indicates that there is a need for sales employees to be armed with a new sets of skills to tackle the problems of working in the digital age. Despite such a bleak outlook, there is still hope for the future. According to Techcrunch’s consumer survey in 2014, it was shown that customer preferences still leaned heavily towards shopping in-store than online, over 6 times more than those that prefer online shopping. With 94 percent of retail sales being conducted in brick-and-mortar stores as reported by the U.S. Census Bureau, it is evident that having a physical presence is still critical to businesses. The PwC Global retail survey in 2015 showed that there was still value that customers could get from visiting a physical store. The top benefit being that customers could physically see their product and access for themselves whether it was worth to purchase. Following which was the immediate satisfaction of receiving their goods as compared to online shopping which cannot fulfill their customers in this way. 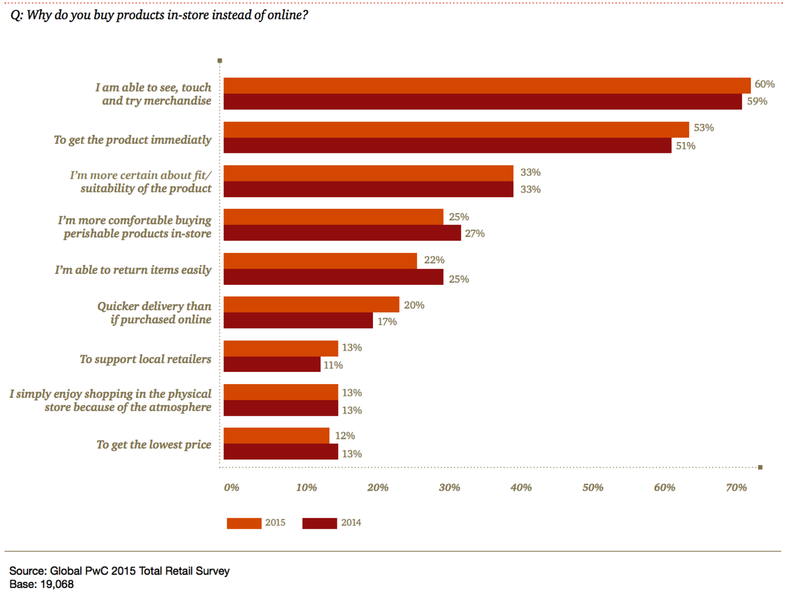 Hence, brick-and-mortar retailers can still find ways to compete against the flood of online retailers. But the question still remians, how can brick-and-mortar retailers improve the shopping experience of their customers? By equipping their employees with relevant skills to remain ever prepared to handle the modern-day consumer. This begs the question, what makes a good retail salesperson? Firstly, the ability to sell people on value. The impression of sales people scamming people into buying products that they don’t need is ever at the back of the consumer’s mind. Hence, it is ever crucial for a professional salesperson to provide genuinely useful insights on to the problems of the consumer and aim to help the consumer solve their problems even if it involves not buying their product. Consistently providing value to your customers is an invaluable skill. One trait that every sales person should have is honesty. The customer places their trust in you helping them make an informed decision. Do not try to overstate the value of your product, in today’s tech savvy world, checking prices is a few clicks away. By being honest, you help create trust and rapport between you and your customer leading to more sales conversion. Knowing your competition is also extremely helpful for the aspiring salesperson. Being able to weigh the costs and benefits of buying a product from online and offline to your customers just demonstrates how well you know the market and how good an offer you are making them. Picking up new ways of persuading someone is also essential for a job that revolves so much around selling a product. Even if you understand the needs of your customer, you still need to convince them on the value of your product. Learning the ins and outs of persuasion such as how to communicate your value clearly and subtle compliments to the consumer is key to successful sales conversion. Lastly, being able to craft compelling stories to illustrate the value that the customer can derive from buying your products is paramount to your success. Consumers want to hear how your product can help them and not simply what it is. Instead of saying “a chilled drink”, “a cold refreshment that’ll quench your thirst” will sound more appealing to the customer. Understanding the role of the modern salesperson and how it has come to impact businesses is a critical aspect of any enterprise to stay afloat in this digital day and age.